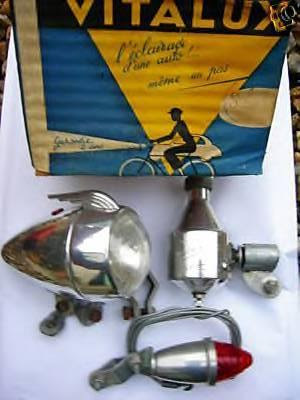 One seller on eBay France has been offering some beautiful NOS light sets. Here are a few examples. #1 - Vitalux outfit with pinecone-shaped taillight. Great graphics on the box, nice sweeping crest over the bezel, and what appears to be a button switch or confirmation lens on top of the headlight. #2 - Radios No.18 headlight with dynamo. Note how the crest above the bezel fits into an indention on the bezel, unlike the other Radios headlights below. #3 - Radios No.16 outfit with No.27 dynamo and conical taillight. #4 - Radios No.18 outfit with No.27 dynamo, this time with a flush-mounted taillight. 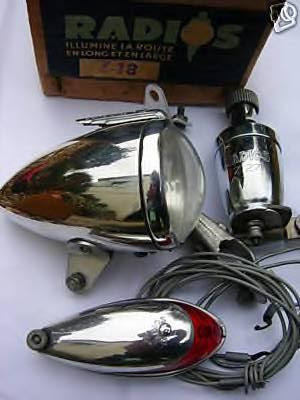 #5 - Radios Z-16 outfit with No.27 dynamo and flush-mounted taillight. 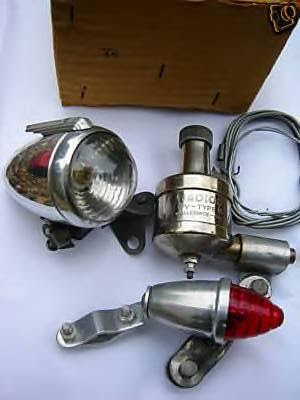 #6 - Radios Z-18 outifit with No.27 dynamo and flush-mount taillight.